Photograph courtesy of Mike Barton. 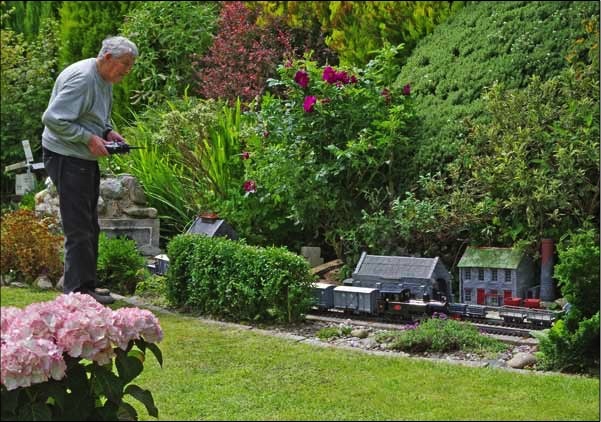 This is a model railway group, which is associated with the 'Association of 16mm Narrow Gauge Modellers' and serves North West Wales and the Isle of Anglesey. The Group was formed in 2009 and presently has around 30 members, the majority of whom are based in the North West Wales area. The aim of the group, is to encourage those who are actively engaged in or who have an interest in the art of modelling items of railway locomotives, rolling stock, track, signalling, and other railway infrastructure to the scale of 16mm to each imperial foot, or, to put it more simply to a scale of 1/19th the size of the prototype. Our group also extends a welcome to those who model in "G" scale, Gauge 3, 7/8ths and other similar "garden" scales and future events on members' railways built to those gauges and scales will be included in our Calender of Events for the group. Providing you are a member of the Association of 16mm Narrow Gauge Modellers, it does not matter what type of locomotive you own, and you will always be welcome to run it at any of our events unless specifically stated otherwise by the host who is holding the event. Details of the loading gauges, minimum radius of curves, etc. for each site may be found in our section on Forthcoming Events. Members of the group who are not also current members of the Association of 16mm Narrow Gauge Modellers will be required to provide proof of alternative insurance cover should they wish to run a live-steam locomotive at any of our events. It is the responsibility of the hosts of events to ensure that any person who wishes to run a live-steam locomotive at such an event is adequately covered by insurance - either by evidence of the current receipt from the membership secretary for the Association of 16mm Narrow Gauge Modellers or by an alternative document, such as a valid independent insurance certificate. A detailed list of the groups' future events and who to contact before your visit is available on our continually updated 'Forthcoming Events' page. Please note that the Forthcoming Events section of our website will also identify if any events are to be held on tracks that are provided with externally supplied traction power and it will be at the sole discretion of the host of that event as to whether alternative forms of power, such as onboard power sources, live-steam, etc. will also be run at the event. "Willie", "Millie" and "Billie" on the Group's demonstration layout, "Rhydwyn Fach" at the Bala Lake Railway "Winifred" Gala Event August 2015, above. which it uses at various local model railway exhibitions, not only to promote itself, but to promote the art of modelling in the scale of 16mm to the foot in general. It consists of one circuit of 32mm gauge track, and one circuit of 45mm gauge track. These are the two gauges that are commonly used when modelling in this scale. Being primarily a demonstration layout, it serves the purpose of helping newcomers to the scale, to choose which gauge they would prefer to work in, and to show what can be done in a relatively small space. It also serves to demonstrate the fact that working in 16mm to the foot does not have to be either a difficult or expensive affair. Our group is insured to operate live steam locomotives on this layout at any venue through a policy that has been arranged through our association with the Association of 16mm Narrow Gauge Modellers. So, if you are holding a railway related event in our area, and you would like our group to attend with our layout and its associated audio-visual and static displays, please contact the Group's Co-ordinator well in advance. If you would like more information about Rhydwyn Fach, please click HERE. you will always be made most WELCOME!